Grievances & Pensions, Department of Pension and Pensioners Welfare. 4. G.O.Ms No.62, Finance (Pen.I) Department, dated 07.03.2014. 5. The PFRDA regulations dated 11.05.2015 on Exit and Withdrawals under the NPS Regulations, 2015. &Pensions, Department of Pension and Pensioners Welfare. 8. G.O.Ms No.107, Finance HR.V-(Pension, GPF) Department, dated 29.06.2017. 9. Representation of the President, A.P. Secretariat Association. 10. Representation of the Chairman, JAC of Employees, Teachers, Workers Associations. 11. Representation of the Chairman, JAC of Employees, Teachers, Workers and Retired employees Associations (AP JAC, Amaravati). by the Contributory Pension Scheme. 3. Accordingly, in the Circular Memo 3rd read above, instructions were issued provisionally extending the aforementioned benefit to the employees of State Government covered by Contributory Pension Scheme (NPS) in toto, duly applying similar provisions of the A.P. Revised Pension Rules 1980 with a condition to adjust the payments/relief made to the employees against the amount of accumulated funds in CPS account, pending finalisation of the guidelines. However, while issuing orders vide G.O. 4th read above adopting exit policy and interim guidelines, the orders issued in the reference 3rd read above, was withdrawn, as a result of which the benefits of Retirement/Death Gratuity and Family Pension, extended as additional relief by the Government of India to its employees are not admissible to the similarly placed persons in the State Government Service or their legal heirs. 4. The Pension Fund Regulatory and Development Authority (PFRDA) has framed "Exit and Withdrawals under NPS Regulations, 2015" on 11.05.2015. 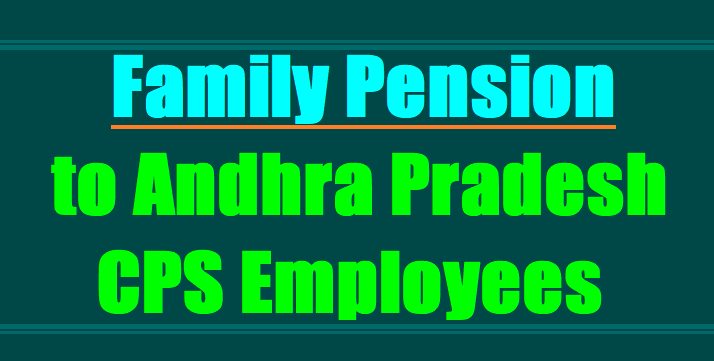 The matter regarding framing of rules on NPS inter alia providing option to its employees or their family members to avail benefits either under NPS or under Old pension scheme as per O.M. dated 05.05.2009, in case of death or disability of a government servant, is separately under examination of the Government of India. Meanwhile the cases of death/disability of Central Government civilian employees covered by NPS continue to be dealt with in accordance to O.M. dated 05.05.2009. 5. As per the regulations 6(e) of "Exit and Withdrawals under NPS Regulations, 2015" of the PFRDA, if the subscriber or the family members of the deceased subscriber, upon his death, avails the option of additional relief on death or disability provided by the Government, the Government shall have right to adjust or seek transfer of the entire accumulated pension wealth of the subscriber to itself. The subscriber or family members of the subscriber availing such benefit shall specifically and unconditionally agree and undertake to transfer the entire accumulated pension wealth to the Government, in lieu of enjoying or obtaining such additional reliefs like family pension or disability pension or any other pensionary benefit from such government authority. 6. The Government of India has issued final orders in its O.M. No. 7 /5/2012-P&PW (F )/ B, dated 26.08.2016 allowing Gratuity in cases of retirement and death of the employees covered by the NPS. Orders in this regard were already issued by the State Government in the Government Order 8th read above. 7. A large number of representation have been received from the respective Service Associations for restoration of additional benefit/relief on death/disability of Government servants covered by the Contributory Pension Scheme (NPS) appointed on or after 1.9.2004 under the Old pension scheme. 8. After careful consideration, the Government hereby order that the additional benefits extended by the Government of India and adopted by the State Government in the Circular Memo 3rd read above and subsequently withdrawn in the G.O. 4th read above, be restored for the purpose of extending invalidation pension and family pension, as the case may be, to the State Government employees and their family members. For the sake of clarity it shall be noted that only similar provisions of the AP Revised Pension Rules, 1980 are to be adopted for calculation of the relevant benefits mentioned above but it shall not be construed as though the employees are governed by the said rules. 9. Accordingly, the Government order that an option be given to the employees covered by the Contributory Pension Scheme (NPS) or their family members either to opt for the benefit of additional benefits restored in para eight (8) above or to draw the accumulated pension wealth as per the regulations of PFRDA. In case, they opt for the additional benefits in para 8 above, the employee (subscriber of NPS) or family members of the employee (family members of the subscriber of NPS) availing such benefit shall specifically and unconditionally agree and undertake to transfer the entire accumulated pension wealth to the Government, in lieu of enjoying or obtaining such additional reliefs like family pension or disability pension or any other pensionary benefit from the State Government. 10. These orders shall take effect from 01.09.2004 and are applicable to those Government employees appointed on or after 01.09.2004 and are covered by Contributory Pension Scheme. 11. In all cases of premature exit due to invalidation/death which were settled in terms G.O.Ms No.62, Finance (Pen.I) Department, dated 07.03.2014, as per the existing regulations of the PFRDA, the benefit mentioned in para 8 above shall be extended only after remitting to the Government account the amount withdrawn from their CPS account by the employees or their family members. 12. The Pension Sanctioning Authorities/Pension Payment Authorities are requested to ensure that the amounts accumulated in the CPS account of the subscriber at the time of premature exit due to invalidation/death are adjusted to Government account before release of the benefits mentioned in para 8 above.